Beginner guitar song Boil'em Cabbage Down - now with an eighth note arrangement, just like "grown-up" flat-picking music! This is a great beginner technique song for both fiddle players and flat-picking guitar players. This is one of the easiest guitar songs around for flat-picking, and for the fiddle, Part A is all on one string. Please scroll down the page for the links to the free PDFs. What I like to do when introducing my young flat-pickers to eighth notes is DRAW on the sheet as if each beat is a ruler marking. Each new beat is an "inch"; each eighth note on the half beat is a "half inch." So far, this makes sense to my students, and they are able to draw in the "inch" and "half-inch" marks themselves, pretty quickly! The "inch" marks coincide with the DOWN motion of the pick, and the following "half inch" marks are where the UP pick motion occurs. In the example above, you can see where I've written D (for DOWN) and U (for UP). Some of the "U"s have parantheses around them; that's because they are "SILENT ups." I tell my students that a DOWN must always come back UP again, even when it is silent. That's also how they learn to strum, so this makes sense to them. Below is an easy-to-count version of this song. It is what I use for starting beginners, when they are just learning to count note values. For a few weeks, we'll stick with this until the notes are learned, and then switch to the eighth note version (above) to focus on DOWN, DOWN-UP with the flat pick. One neat thing about the first part of Boil'em Cabbage Down on the fiddle is that the melody stays all on one string -- perfect for beginning fiddle players. Even very young children, just learning their finger numbers, do well with this piece. The rhythm is all the same -- "blue-ber-ry, blue-ber-ry," is how we say it for my beginners. Or, "One-two, one, one, One-two, one, one," as we clap the half notes and quarter notes. This sheet is only half the melody, but since it uses 2 strings and employs a tricky rhythm, that is quite enough for a young guitar player. Look at the slow (in appearance) rhythm I have presented this song in (it really uses quarter and eighth notes, not the ponderous-appearing half and quarter notes). Students will certainly want to stroke it all DOWN strokes (Down, Down-down), and at first that will be fine. But as they get able to play it faster and faster, you will want them to flat-pick it with a Down, Down-UP stroke. For beginning fiddlers, I like this simple sheet with only half the melody. It is clean, with no distractions, not even chord symbols. To be able to get all the way to the end of the page seems like a real accomplishment, and even that may be too much for a very young beginner. Save the full piece (see below) until after they can do part 1 smoothly, unless they are eager for the whole thing NOW. 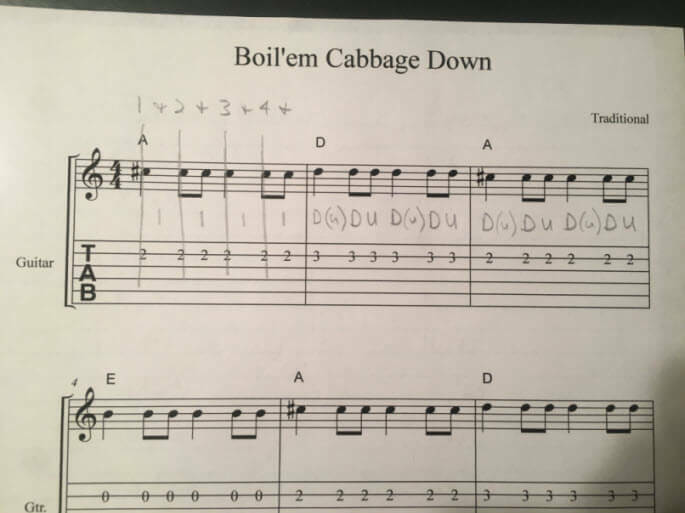 Boil'em Cabbage Down is also my favorite way to have guitarists learn the A - D - E chords. But I recently taught it a new way to a beginner... instead of STARTING with A then going to D & E, I started with Em, a chord (the only chord) he knows well. Then, keeping the Em chord (fingered with 1 & 2), we changed fingers to 2 & 3, & added the index (finger 1) in fret 1 of the G string to change the chord to major. From THERE we slid down with “anchor finger” 1 (index finger) to the A chord. Fingers 2 & 3 surrounded the 1 finger, on the adjacent strings. Back & forth we played the chords. Finally, we added the D chord. Soon he had it almost memorized, as we played Boil'em Cabbage with a DOWN, DOWN-UP rhythm. Then finally I had him try without looking at the strings. That is also his goal for his next guitar lesson, to be able to play and change these chords with closed eyes. Here is the full melody of Boil'em Cabbage Down, on two pages for guitar and fiddle. I've put the Harmony part on top, instead of on the bottom where it is usually found, so that beginners won't have to search so hard! So what's the POINT of this "easy-peasy" ensemble arrangement? Mostly just to get them playing something that sounds like music, while working on their flat-picking. And also, helping them feel a rhythm and hear simple harmony without being distracted and thrown off their part (a common occurrence in duets with beginning piano players). This duet can be considered a Trio if a third guitarist strums the chords (but they'd better not strum too loudly and drown out the flat-pickers!). How in the WORLD can we know what the rhythm is, with these guitar tabs? Answer... we can't! And this is an excellent opportunity to stress to your young guitarists the importance of learning how to read standard notation. They want to be independent musicians, right? Or do they want to have someone always holding their hand? Of course, you can pencil in a few notes in between or below the staves... quarter, eighth-eighth, quarter, eighth-eighth, etc. That's what I do. But the rhythm... well, you'll have to teach them by rote. You might do what I'm doing with this duet: writing "D DU D DU" etc., indicating "Down, down-up, Down, down-up" in each measure. Here is the new violin (or fiddle) duet, also with an easy open-strings only harmony. Will it be what your beginners WISH to play? NO - they'll really want to play the MELODY. But here is where they can practice their bow strokes while making music, without having to worry about their left hand. All right, I'll admit that measures 23 and 24 are a bit startling, with the sudden divergence between melody and harmony. Melody dives to the low G string, while the harmony leaps up to high E! OH WELL - this song is very much about keeping the shuffle rhythm going, and making an easy duet together. I haven't heard any complaints yet from my newest violin student. No key signature. Right. Those are a very confusing item for beginners - I don't really go there for a while. You will have to introduce your young fiddlers to the concept of chord symbols - they are very likely to presume the "A", "D", and "E" letters over the staff are the note names, especially as they often do happen to coincide, especially in this little duet. As is common with traditional or folk sheet music, you can find many variations of the melody and words. The version I have here is like the one used by Brian Wicklund in his book Mel Bay American Fiddle Method, Vol. 1 (Book & CD). It is the first song in his very fine and useful book, which I use with my fiddle students. However, instead of waiting until violinists can read and count these rhythms, I start the young ones out reading this song with half notes and quarter notes, so they can count it. Most young fiddle and guitar players don't really understand eighth notes... they just feel them and learn rhythms by ear (listening over and over). Playing by ear is necessary, but not enough to make a truly independent musician. For my non-readers learning how to play fiddle, they can use the music like a map, as long as they know their alphabet and numbers. I have them choose different colored felt pens to circle or loop around note groups -- all the notes on the A string, for example, might have a pink circle around them, or a pink loop enclosing them all, or a pink line linking them together. The student chooses which color pen goes with which "string". Recently, one of my young students (perhaps fearing I was about to make a mess out of his music with blue, green, and pink pens) suggested tiny dots of color beneath each note, instead of big loops. Very dainty. And fast! The words of this melody do not match the rhythm most commonly used by instrumentalists in Boil'em Cabbage Down! You'll catch on to this if you listen to groups perform it. Won't you be my bride. Brian Wicklund has more words in his book, Mel Bay American Fiddle Method, Vol. 1 (Book & CD). There is so much you can teach beginning fiddlers and guitar players with this simple but fun piece! The more you work with it, the more uses you find for it as a teacher. It is a terrific, high-energy song for groups, but is excellent for brand-new beginners to wrestle with on their own. When they learn to play it up to speed, it will be FUN too!